"Shut up, Shirley! I don't trust the valets!" Parking your car in a lake is easy. Maybe you’ve left your car in neutral on a steep embankment next to a lake and gravity did the parking for you. You may have mistaken the lake for a rippling parking lot filled with cresting wave-like shopping carts. Or you parked your car in a ditch at the start of monsoon season and the lake sprang up around it. Regardless, the easy part is over. Now you face the more difficult challenge – getting the car back out of the lake. You could hire a tow truck to drive in after it, but that is a costly business. Similarly, a crane could be employed to retrieve your vehicle, provided it has ample bill length and unnatural avian strength. Or you could just drive your car out of the lake. Really, it’s the only rational choice. To find your car, swim directly into the lake. If the car is floating it will be easy to spot, although some turtles may be mistaken for a floating car. If you find a turtle -- keep searching, as this is not your car but a reptilian imposter. If the car is sunken, the process for locating it is trickier. 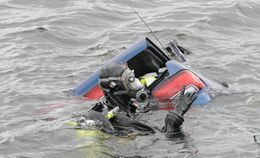 Sunken cars require scuba gear, a metal detector and, if the lake is dark, a strong flashlight. Now plumb the lake’s depths to locate your missing vehicle. If the metal detector or flashlight stop working, check the batteries. Once you’ve found your car, you must get inside. If the car is floating, the act of getting inside may cause it to sink. This is a good thing, as you need the car to be at the bottom of the lake in order to drive it. A car will not move unless the rubber meets the road. In this case, the lakebed will act as road. To enter a sunken vehicle, simply open the door. If the door will not open, it may be locked. Use your keys to unlock the door. If you’ve parked your car in the lake with the keys still in the ignition, resurface and acquire a metal coat hanger. Bend the hanger, slip it down through the top of the window and use it to jimmy the lock open. If the door still will not open, the water pressure may be too great at this depth. We probably should have mentioned that earlier. No matter, just break the window. ↑ If your car is a convertible you may skip this step, as the inside of your car is always outside. Unless you keep the top up, but then what is the point of owning a convertible? Freak! "Wade right there. Gotta grab my jumper cables from the trunk." Now that you are inside of the car and it is properly submerged, it is time to start the engine. Insert your key into the ignition and turn. If the car doesn't start after a moment, stop turning the key, give it several seconds and then try again. Be certain to alternate periods of turning and not turning the key so as not to flood the engine. If the car still will not start, the problem may be electrical. This is common in newer cars, the systems of which are not made to withstand many driving situations that were once standard practices. If the problem is electrical, have a friend park their car near the lake's edge and hope that they have a set of extra long jumper cables. When you discover that you keep ill-prepared friends, replace your car's battery. ↑ Noble pursuits such as car polo, lake parking and drag races with cliffish finish lines may be more damaging on the modern vehicle, but everyone parked their Ford Edsel at the bottom of a lake. Some still remain, firmly parked as mussel farms, providing iron and other minerals in support of the ecosystem. ↑ Also, consider replacing your friends. You will have to be careful not to get your car stuck in the mud, weeds, and holes at the bottom of the lake. It helps if the lake has a sandy or rocky bottom, and/or if you have 4-wheel drive. Do not drive too fast or accelerate too quickly as the driving surface may be slick. Hopefully you have a full tank of gas so that you don't run out before you reach the land. A detailed map of the lake may help you reach your destination, which is anywhere not in the lake. It helps if this map lists all the underwater features of the lake, such as tree roots, large boulders, sunken logs, dirt or gravel roads, groves of dead trees, sinking mud features, crab farms, stacks of old tires, sunken ships, patches of sand, and possibly even plane wrecks. Should it be an urban lake, these features may include fire hydrants, streetlights, other cars parked underwater, clogged storm drains, fallen trees, underwater power lines, and underwater roads. Once you are back on dry land, simply open the door. Most of the lake will come sloshing out. Whatever remains should be cherished as a precious keepsake of that time you drove your car out of a lake. ↑ Until it, like all good things, evaporates. The smell always lingers, though. This page was last edited on 21 February 2016, at 05:44.